I have problems with this novel. It is undoubtedly a stirring account of faith and human endurance tested to the limit, and a dramatic representation of the clash of two opposing cultures and belief systems, both in their own ways ruthless and determined to destroy the other. And that’s where my difficulties begin. The plot is depressingly familiar in this postcolonial world. Jesuit priests first started their mission of conversion in Japan in 1549 under St Francis Xavier, the Basque co-founder of the Jesuits, who also evangelised India, Borneo and other oriental countries. At first the Catholic faith was embraced enthusiastically, until by 1600 there were said to be some 300,000 Christians in Japan. There followed several waves of repression and persecution, most notably after the Shimabara Rebellion of 1637-38 in the Nagasaki province. Here the mostly Christian peasants, with some ronin, rose up against crippling taxes and cruel conditions. The rebellion was crushed by a huge military force, aided by the Dutch, who were not only anti-Catholic, but also defending their trading interests. Silence tells a lightly modified true story of a group of three Portuguese priests who refuse to believe the news that their former teacher at the seminary, a saintly Jesuit called Father Ferreira, had apostasised after many years of mission in Japan, and was even collaborating with his former torturers and taken a Japanese wife. They sail in the early 1640s to Japan on a dangerous quest: to find out the truth about Ferreira, and to rekindle the flame of their faith in a country where Catholicism is now banned, and any Christians discovered by their persecutors liable to be forced to renounce their faith or face torture and death. The story, as I said earlier, is powerful and moving. The protagonist, Sebastian Rodrigues, sees his two colleagues succumb to the appalling conditions they face. They are sheltered and protected by the ‘hidden Christians’, poor fishermen and peasants, who not only live a life of punishing hardship, working like animals in their fields or boats to scrape a basic living, being forced to hand over most of what they earn in taxes to their cruel, oppressive masters. It’s a feudal system of tyrannical injustice for the dispossessed majority. Rodrigues, a devout, engaging priest in his early thirties, is determined to endure every ordeal, although not surprisingly he has moments of self-doubt about his fortitude. If torture and martyrdom are to be his fate, as seems most likely, he is resolute that he will not go the humiliating way that his mentor, Ferreira, is said to have gone – but he’s not sure he has the right stuff to be a martyr; he hopes he has. This aspect of the novel is its most interesting and honest. When the ultimate test comes, and he is forced to choose between preserving his own integrity and life while being forced to watch those in his flock who look to him for spiritual guidance and sustenance being tortured horribly, and renouncing his faith, the suspense is almost unbearable. Are the repeated references in the narrative to the silence of God in the face of the sufferings of his faithful an indication of his absence? Will Rodrigues be Peter the rock or the denier? Will he replicate the role of Judas? And does he understand Judas – if Jesus could love even him, could Rodrigues do the same and love himself if he reneged? Why my problems, then? First, I found the unrelenting scenes of hardship, poverty and torture rather too much. There are lurid descriptions of Christian martyrs subjected to a lingering death in ‘the pit’ – they are cut then suspended upside down in it so that they slowly bleed to death. Other equally unpleasant methods of torture and despatch are related. I’m sure it’s an accurate representation of what happened, but I found the narrative dwelt just a little too luridly on these details. On the one hand they show the bravery and resolve of those humble peasants who had risked their lives to protect their priests and uphold their faith, even when subjected to the most terrible physical ordeals. But on the other they seem also to reflect the willingness of those Jesuit missionaries to allow them to do so, and to demonise the cruel persecutors, as I shall show shortly. I was reminded of the treatment of this kind of mission and persecution in Heart of Darkness – a novel which has its own problems with its depiction of European colonisation and exploitation of a far distant country, but which entertains rather more of an ambivalent set of possibilities about the exploitative nature of the European incursion – although admittedly the motives of those colonisers were not the same as the Jesuits’ in Japan. But the Europeans’ belief in their moral and cultural superiority and in the justification for their missions were similar. I also think of the conquistadors and their rapacious ‘conquest’ of Central and South America around the same time as the Jesuit ‘conversion’ of Japan and other far eastern countries; the Spaniards had more transparently venery motives disguised as a Christian mission of evangelism. That the Jesuits were entitled to ‘convert’ the ‘infidels’ as they call the indigenous Japanese goes unquestioned in this novel. The focus instead is on the crisis of resolve of Rodrigues. But he undergoes no such crisis about his very presence in a country where he assumes the right to impose his own faith on its inhabitants. The persecutors, as in didactic medieval European martyr narratives and hagiography, are depicted as evil monsters and devilishly cunning as well as cruel. In the seams of the cloth the firmly entrenched lice looked just like white dust, and as I crushed them one by one with a stone I felt an inexpressible thrill of delight. Is this what the officials feel when they capture and kill the Christians? Such passages show the skewed polarities of viewpoint presented in the narrative; saintly martyrs versus demonically sadistic persecutors. At the very least the narrative is politically insouciant or naïve. The magistrate Inoue, with whom Rodrigues faces his ultimate contests, makes his predecessors look like ‘simple-minded’ beginners. He smiles and smiles and yet is a consummate villain. This is too close to caricature; he has none of the troublesome complexity of Iago. My objection ultimately, then, is that despite its merits as a literary text – the epistolary and ‘found document’/diary elements are skilfully deployed, and the translation is smooth and largely unobtrusive – Silence is essentially too naive and didactic. This probably says more about my agnostic shortcomings in approaching a faith-based text than the novel itself (doesn’t stop me admiring Paradise Lost or the Divine Comedy), and I acknowledge that I may well be understating its merits: it’s been highly praised by the likes of John Updike and David Mitchell, and won literary prizes. 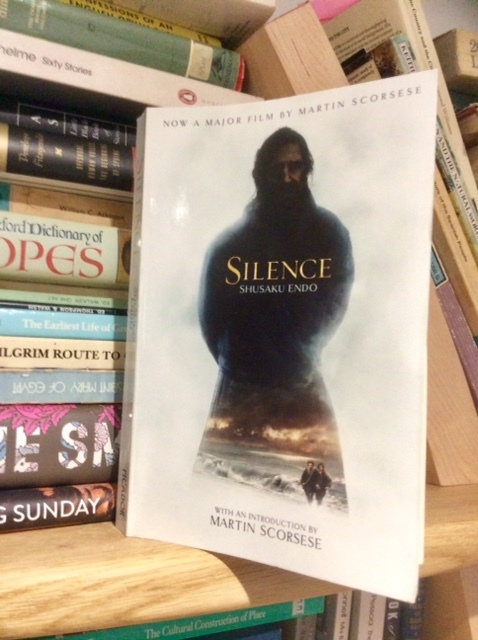 The film version by Martin Scorsese (who also wrote the Introduction to this paperback edition) that came out around the beginning of this year was praised by critics. There’s another made by Japanese director Shinoda in 1971, and one in Portuguese by J. M. Grilo from 1996, called ‘The Eyes of Asia’ in English. And like the sea God was silent. His silence continued. But the recurring figure of Kichijiro, a local Christian fisherman who acts as a guide to the Portuguese priests, but who also betrays them and his fellow Christians repeatedly, was treated with cartoonish broadness. His rascally, drunken cowardice and tricksterish duplicity served more to highlight the integrity and resolve of the priests than to suggest the dangers and hardships endured by the oppressed peasantry and the ‘hidden Christians’. Their fate and courage is incidental to that of the European conquistador priests. Brian Moore treats the Jesuit incursions into and dealings with the indigenous people of Canada in, to my mind, a more successful literary way in Black Robe, which I posted about in the first year of this blog.